If you are planning a trip to one of the Dreams Resorts & Spas in the Dominican Republic, there are a number of exciting excursions and sights for you to consider. Of course we offer wide range of activities and entertainment at our resorts as part of our Unlimited-Luxury© privileges, but if you are looking to experience an action-packed outing off-property, we’d recommend trying the Bavaro Splash Speedboat Tour through Amstar. 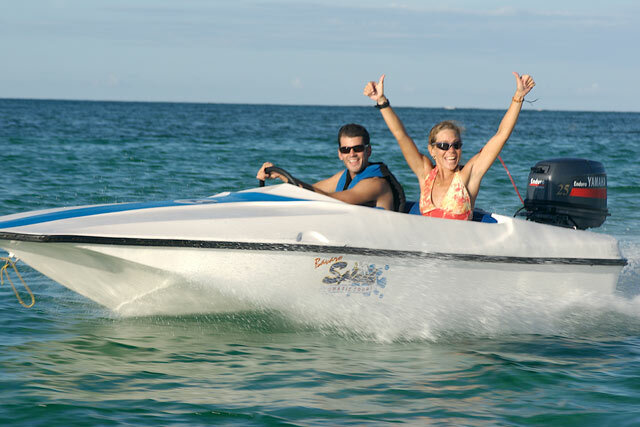 Race along the Bavaro coastline in an exhilarating two passenger speedboat James Bond style! Drive around the coast and reach the perfect spot over coral reefs and get ready for a fantastic snorkeling experience. Dive right in and take a look at the variety of multicolored fish that inhabit this part of the island. Get up-close and personal with these beautiful creatures that will eat right out of your hand. The Bavaro Splash Tour in includes transportation to and from the hotel, a two passenger speedboat, snorkeling equipment and soft drinks. It is recommended that participants wear comfortable beach clothes, shoes and a bathing suit. Don’t forget to bring a beach towel, sun block and a hat or sunglasses. An underwater camera would also be great to capture photos while snorkeling. The tour takes approximately five hours, leaving at either 8:30 am or 1:20 pm. To book your excursion today, visit the Amstar website. See you soon! This entry was posted in Dreams La Romana, Dreams Palm Beach, Dreams Punta Cana and tagged Amstar, Bavaro Beach, Dominican Republic, excursions, Punta Cana, snorkeling, speedboats, tours. Bookmark the permalink.